Following Hideo Kojima’s departure from Konami in 2015, the question left lingering was clear: in which direction would the Metal Gear series that he created move next? The answer is, literally, an alternative reality. Kojima may have left Metal Gear behind but his next project, Death Stranding, looks wild as hell. 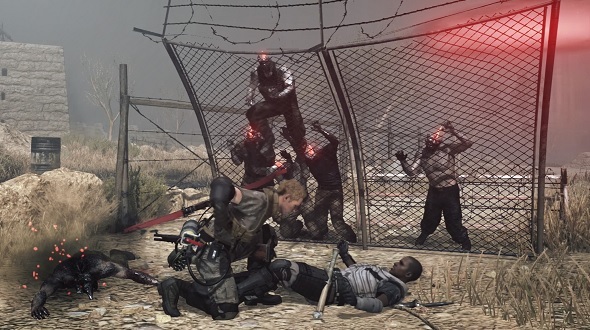 Metal Gear Survive takes place in a separate reality to that in which other outings in the series have played out; one that asks you to believe in and act upon events and ideas that Metal Gear has not presented to us before. The ‘Survive’ of the title is accurate, with many of the new concepts revolving around keeping your personal avatar alive within an environment that has other plans for you. After four hours of game time under my belt, I can tell you that some of these ideas are immediately engaging and others are not – although it is worth stating that Survive is a game clearly designed with long-term satisfaction over short-term thrills in mind. In a manner not at all dissimilar to indie survival game Don’t Starve, your long-term goals involve scouting a hostile environment for resources and food; the former used to upgrade your base and grant you access to new tools and gadgets, the latter to keep you alive. You might find various metals and wood in an abandoned camp or decrepit shipping container, for example, whilst wild animals, plants, and watering holes provide food and drink. 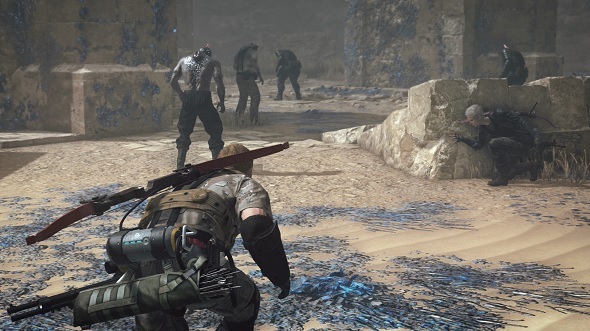 Seeking out and acquiring these resources is a matter of constant concern rather than an optional distraction, giving Survive a wildly different gameplay tone to any other Metal Gear. This is not a game about staying invisible in the world, it is a game about cultivating and staying in charge of it. The food and drink situation is the best example of the negative impact of such a change. Hunger and thirst indicators are glued to your HUD, the rate at which they deplete being both horrifying and ridiculous. If you forget to monitor them for only a short time you are liable to be caught out and die of starvation at any moment. Indeed, across my four hours with the game, this was the primary means through which I encountered death. It is hard to believe that you are playing as an elite soldier when you are incapable of undertaking a 30-minute hike without multiple bottles of water and an inventory full of food. Thankfully, this is a problem of balancing rather than one of core system design, and that means there is still time to fix the issue prior to February’s release. Still, the build that I played is far off the mark in this regard. 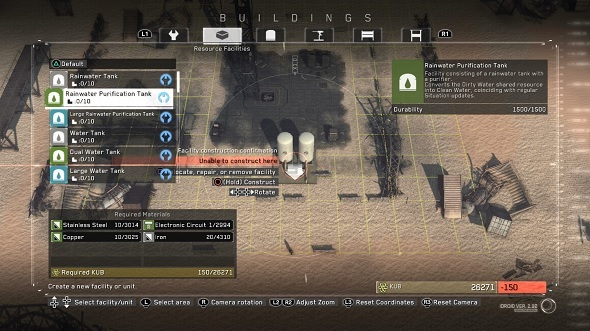 Base building represents a more positive outcome for the change in tone thanks to the range of objects that can be acquired and the pace at which they are unlocked. Defensive walls and sandbags, Molotov cocktails, enemy lures, and various firearms and melee weapons were all unlocked in my playthrough, all of them arriving at a slow enough pace that you learn to appreciate and fully understand the possibilities of what you have at your disposal. Being forced to engage with the modest set of tools given to you at the start helps to build within you a keen understanding of Survive’s core mechanics. You cannot, in other words, win early by immediately getting your hands on the game’s best gadgets and sidestepping the development of your own skills. Whilst forcing players to do anything is an increasingly dirty concept within videogames – which, more now than ever, are built from an obsession with player freedom and choice – the pace at which you unlock weapons in Survive should set you in good stead for the (presumably) more difficult challenges to come. 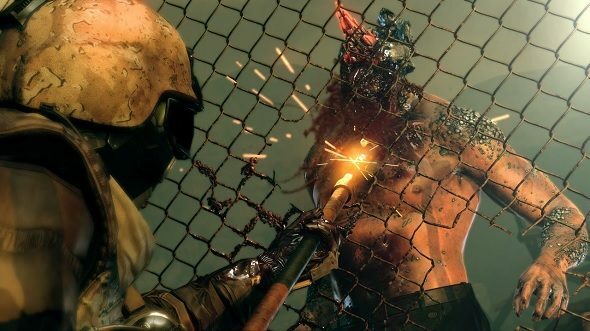 If the survival ideas echo Don’t Starve then the combat is something closer to Fortnite crossed with more traditional Metal Gear offerings. Creatures dubbed Wanderers roam the environment or, at least, those parts of the environment into which you are sent on missions to acquire the parts you need to escape this alternative reality setting. Wanderers are zombies for all intents and purposes. Their movement is slow and lumbering, they are easy enough to sneak up on and stealth kill, and they only present real danger when they surround you as a group. Fortnite’s ideas come into play in that you can build defensive structures – walls and sandbags, for instance – wherever you are, so long as you have already pieced them together at the relevant work station in your base and added them to your inventory. It pays to hone your skills in placing these sorts of structures given that missions often force you into direct contact with large numbers of Wanderers. Not to mention that your limited resources means you are usually without enough bullets or Molotov cocktails to kill all of them from afar. Placing chain link walls temporarily stops them in their tracks and allows you to stab them to death with melee weapons from the other side. Position your walls correctly and you can dispatch large numbers of them without firing a bullet. Accompanying the single-player bid for survival is a wave-based multiplayer setup which is even closer to Fortnite. Here you must use all of your construction and combat skills to defend a base from huge numbers of Wanderers. Without question, this multiplayer component is the best thing I have experienced while playing Survive. 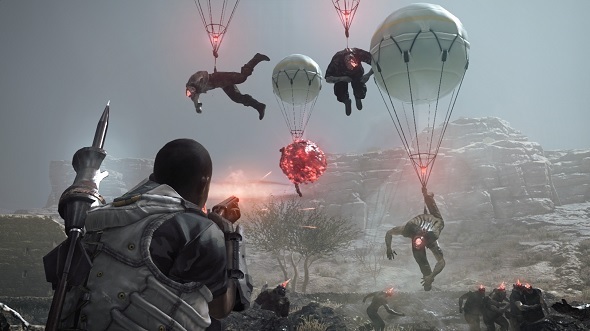 Four players can team up and work together to defend the base in the most efficient and cost-effective way possible. With multiple players working together the shape and complexity of your interlinking walls and traps can be taken to a place far more interesting than they can in the single-player, offering a greater diversity of outlooks and results. Each wave is more challenging than the last, so it pays to communicate effectively and be smart about the volume of resources you are spending for each attack on your base. Between waves you have the opportunity to gather more resources, but if you spent too much in your previous battle you will not be able to fully replenish your stocks before the Wanderers return. The tension mounts as you get closer to the final wave, with the combination of increasingly limited resources, decreasing ammo stocks, and injured allies rising into a crescendo of drama and tension as each session plays out. This drama is ramped up further thanks to map design that forces Wanderers into bottlenecks that concentrate the action and give you flashpoints that create an evolving narrative within each wave. By focusing the actions across these lanes, Survive’s multiplayer is able to offer a more stable and consistent degree of engagement than what its single-player can achieve. 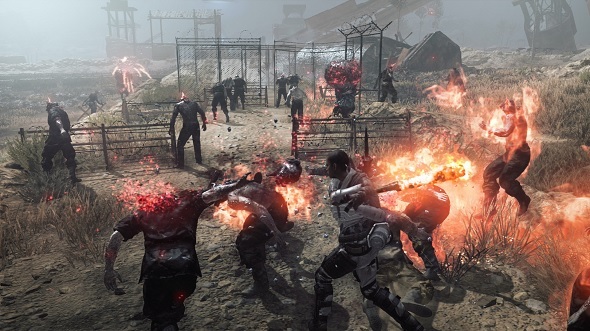 With its incorporation of ideas from Don’t Starve and Fortnite, along with those more recognisable actions from Metal Gear, Survive is very much on trend with modern gaming fashions. Many of its ideas can be seen elsewhere, but the specific combination of them here presents something a little different from what has been seen before. Some of those differences need further balancing, but for a game of this sort it has become the norm to perform such surgery post-release. As it stands, multiplayer is the star element and is so entertaining that it makes the single-player look incomplete by comparison. There is certainly a lot of potential here, but Survive has a way to go before it earns its place alongside the games Kojima left behind.